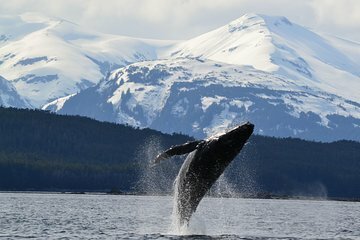 Programe a viagem para a Inside Passage do Alasca nesta excursão em terra de observação de baleias do porto de Juneau. Do conforto de um barco a jato aquecido ou catamarã, desfrute de vistas de fiordes e montanhas de neve, e delicie-se com uma mistura de vida selvagem, incluindo orcas, jubartes, lontras, leões marinhos e águias. Após este memorável cruzeiro, aqueça-se com caranguejo fresco no King Trace's Original Tracy's Juneau. Esta excursão terrestre de 3,5 horas inclui transporte para a Baía de Auke. Quando estiver de volta à cidade, aproveite o King Crab Original de Tracy, de Juneau. Nenhuma visita a Juneau está completa sem avistar jubartes e orcas nas belas águas da Inside Passage, no Alasca. Do porto de Juneau, dirija-se ao estacionamento Mt Roberts Tramway e embarque em um ônibus que leva você ao Porto de Auke Bay. No caminho, ouça comentários informativos de seu motorista nas vistas e, se o tempo permitir, você poderá ver apenas o Mendenhall Glacier. De Auke Bay, suba a bordo de um barco a jato ou catamarã com decks de visualização espaçosos e uma cabine aquecida para seu cruzeiro de 2 horas. Embarque na Inside Passage, uma rota costeira cheia de geleiras e fiordes. Entre montanhas cobertas de neve e fiordes, aprecie avistamentos de leões-marinhos, lontras e águias-carecas. Uma vez que uma baleia é avistada, seu capitão desacelera o barco e desliga o motor. De maio a setembro, fique atento para as vagens de baleias, incluindo bezerros que deslizam ao lado de suas mães. Capture-os rolando ao longo da água e não se surpreenda se sua curiosidade os aproximar de seu barco à deriva. Cruze passando por afloramentos rochosos com focas, leões-marinhos e lontras ocupados no trabalho e no lazer. Você retornará ao seu navio com muitas fotos e vídeos incríveis de vida selvagem. Garantiremos que sua excursão termine com tempo suficiente para você retornar ao porto de Juneau para a partida de seu navio. No caso extremamente improvável de o seu navio ter partido, providenciaremos o transporte para o próximo porto de escala. Se o seu navio estiver atrasado e você não puder participar desta atividade, seu dinheiro será reembolsado. Veja nossos termos e condições para detalhes completos. Saw many whales and the guides were entertaining and knowledgeable. I had never gone whale watching before so to see them 'bubble feed' was amazing, and we watched them 6-7 times. So glad we went and the crew was fantastic from our Capt. Steve who found the site to Mark the biologist who was extremely knowledgeable he studies whales to Lukos who actually did the helping in and out and distributed the water and snacks. At Tracy's we had the King Crab combo - One crab leg, soup and crab cakes a 36 value. All in all we enjoyed the day, from getting on the bus right under the tram on the pier to getting dropped off steps away from Tracy's it was a good tour. HINT your paperwork from Viator is all you need for Tracy's. It was a great tour. We actually saw whales in the port area. A small group, so we were able to get up and go out on the deck easily and get a great view without the window in the way! The guides were funny and very knowledgeable. Tracy's Crab Shack was incredible. We've already recommended this tour to friends going in August. Great Day! We saw 14 whales feeding together and doing a bubble net to get their food. The weather definitely helped. It was sunshine and 67 degrees. The crew was fun and informative. The boat was easy to ride on and to take pictures from. We had the whale watch and crab feast so we went to the Twisted Fish Restaurant and had crab legs, clam chowder and a huge garlic roll. Amazing! The price of this combo was definitely worth it. My whale watching tour was amazing! Loved Captain T and first mate Brendan. They were both so knowledgeable and very engaging. Our group of six, ages 12 to 75, all had a blast! Don't miss this tour. Also, the Alaskan King crab lunch after the tour is delicious. drink and gratuity are extra. This excursion was great. We saw not only humpback whales but Orca's as well. The crew and staff were very knowledgeable and open to questions and communication. The only reason we give it 4 stars instead of 5 was because the Crab Lunch/Dinner was not available and we were not made aware of that until the day of the excursion. Part of our money WAS refunded for that but it was still a disappointment.